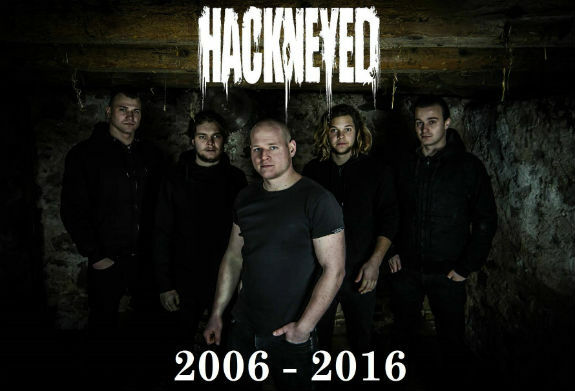 "10 years of Hackneyed, dear fans and supporters! A whole decade! It’s almost 10 years ago since Phil and Tim came up with the idea to start this band. From this moment on, everything was different. We wrote our first tracks, rehearsed them together and played our first live shows. We don’t want to lie, it was a beginning with many ups and downs, but it was all worth it. "And then in 2008: the big bang! Discovered by Achim Ostertag (thank you so much for everything! ), we got our first record deal with gigantic Nuclear Blast, followed by two great albums and uncountable shows all over the world. Two years later, our journey went into different directions and we got the chance to release a third album at Lifeforce Records back in 2011. "The next great step came in 2015: our very own music label, CoMa Tone Records, and a fourth album that we released ourselves - which makes us extremely proud! Furthermore, we toured all over Europe with idols like Morbid Angel, Kataklysm, Nile or Arch Enemy and played at big festivals like Wacken Open Air, Summer Breeze, With Full Force or Barge To Hell. "We achieved so much, way more than we ever imagined and we are incredibly thankful for everyone who has been a part of this journey! You guys are the reason why we made it that far! "But of course we won’t leave without saying goodbye to you, our fans and supporters. We want to celebrate the 10 years we were together - which is why we’ve planned several (festival) shows in 2016, topped off with a farewell concert towards the end of the year. We’re really counting on you to take part in this last step of Hackneyed’s journey. Let’s make it BIG! Let’s make Hackneyed remain in our minds and hearts FOREVER!" 0 Comments on "Hackneyed Breaking Up"